The U.S. market for bacterial conjunctivitis drugs has been declining sharply over the last few years. Analysts project the trend to continue in the coming years. In 2013, the market’s opportunity was valued at US$473.3 mn, which is likely to reduce to US$439.8 mn by 2024. In the coming years, the market will have to experience a patent cliff as the top U.S. brands of bacterial conjunctivitis drugs, such as AzaSite, Zymaxid, Moxeza, and Vigamox, are set to lose their marketing exclusivity very soon. The growing genericization of antibacterial drugs has impacted the demand for branded drugs significantly. The generic versions of patented formulations, with almost same efficiency as the latter, are easily available at much lower rates in the market. This has increased the sales volume, albeit at the cost of revenues. Many branded ophthalmic drug manufacturers have incurred huge losses due to the generic cannibalization in this market. Apart from this, the rising prevalence of multi-drug resistant organisms (MDROs), triggered by wide usage of antibiotics, incorrect drug dosage, and inappropriate medications, has created serious challenges for the treatment of infections such as bacterial conjunctivitis. Researchers across the world are working on discovering efficient drugs for these MDROs. However, the non-availability of effective medications in near future is likely to hamper the market’s growth over the coming years. Although the market is facing a number of restraints at present, it may experience a little relief in future if the product development partnerships (PDPs) models for business are implemented by participants. As various research and development procedures incur a high amount, exerting substantial pressure on pharma companies, strategic alliances with small biotech research organizations will prove to be beneficial for both the parties. Fluoroquinolones, macrolides, and aminoglycosides are the major classes of drugs used for the treatment of bacterial conjunctivitis. The demand for topical fluoroquinolones is the highest among all classes of bacterial conjunctivitis drugs in the U.S. However, the segment is projected to be hindered severely in the coming years, owing to the forthcoming patent expirations of bestselling drugs of this class, such as Vigamox, Moxeza, and Zymaxid by the end of 2016. The market’s opportunity will also be hurt significantly over the next few years due to the encroachment by generic variations of these drugs and decline from US$361.9 mn in 2013 to US$286.4 mn by 2024. Valeant Pharmaceuticals Int. Inc., Santen Pharmaceutical Co. Ltd., Pfizer Inc., Perrigo Com. Plc., Novartis AG, Merck & Co. Inc., F. Hoffmann-La Roche Ltd., Bayer AG, Akorn Inc., and Actavis Plc. are leading the market for bacterial conjunctivitis drugs in the U.S. The imminent patent expiries is likely to hurt the business of these players significantly in the near future. However, the rising prevalence of bacterial infection in eyes and the increasing susceptibility to infection among individuals of various age groups may provide rewarding opportunities to participants over the next few years. Players are recommended to focus on developing herbal medicines for the treatment of bacterial conjunctivitis, as the consumer preference is shifting from pharmacological medicines to herbal treatment regimens. Bacterial conjunctivitis is a commonly encountered eye problem across the world, caused by various bacterial strains such as streptococci, staphylococci, chlamydial, and gonococci organisms. Majority of the cases of bacterial conjunctivitis are self-limited and acute and not a major cause of morbidity. This study provides market analysis for various antibacterial drug classes used for the treatment of bacterial conjunctivitis. The stakeholders of this study comprise established pharmaceutical companies involved in the commercialization of antibacterial drugs as well as new participants who wish to enter the U.S. market. This market study provides a complete analysis of the bacterial conjunctivitis drugs market in the U.S. and helps in identifying various market governing factors. The market overview section provides exhaustive information of the incidence rate of bacterial conjunctivitis, list of API manufacturers, patent challenges, market trends such as drivers, restraints, and growth opportunities that currently control the dynamics of the overall market. The section also recommends and predicts the future conditions of the market. 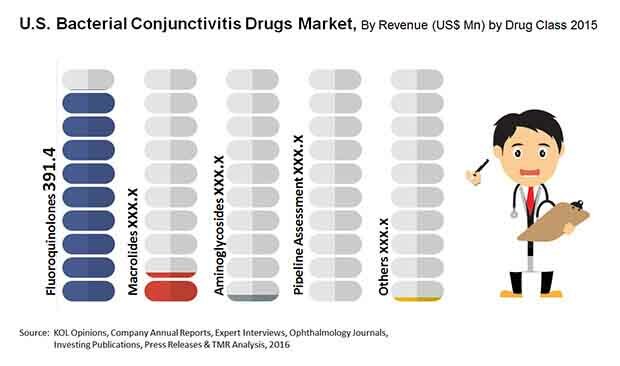 Market strategy tools such as event impact assessment and Porter’s Five Forces analysis have also been incorporated in this report to provide balanced analysis about the level of competition within the bacterial conjunctivitis drugs market in the U.S. Executive summary provided in the report encapsulates comprehensive insights about every segment considered in this study. Besides, it includes a market snapshot, which offers a glimpse into the current scenario of the bacterial conjunctivitis drugs market in the U.S. in terms of current and future market size along cumulative growth rate. Additionally, this study includes a regulatory framework segment wherein the overall regulatory scenario of the U.S. drugs policy has been described. Participant analysis tools such as market share analysis have also been included in the market overview section of the report to deliver a broad spectrum of the overall market scenario in the bacterial conjunctivitis drugs market in the U.S. The bacterial conjunctivitis drugs market in the U.S. has been segmented based on various antibacterial drug classes. The market is segmented into major types of antibacterial drugs such as fluoroquinolones, aminoglycosides, macrolides, and others. The fluoroquinolones segment has been sub-segmented into ciprofloxacin, ofloxacin, levofloxacin, moxifloxacin, gatifloxacin, and besifloxacin. Aminoglycosides has been sub-segmented into tobramycin and gentamycin. Macrolides has been divided into erythromycin and azithromycin. The others segment is analyzed cumulatively, considering bacitracin, fusidic acid and ceftriaxone within this class. The market size for the period from 2012 to 2024 has been provided for each of the major drug classes mentioned above in terms of USD million. Along with the market size that were projected considering 2013 as the base year and 2012 as the historical year, the CAGR (%) of each market segment for the forecast period from 2012 to 2018 and 2018 to 2024 have also been provided. The report concludes with detailed profiles of leading players in the bacterial conjunctivitis drugs (antibacterials) market in the U.S. The study profiles the companies in terms of overview, financial overview, product portfolio, business strategies, and recent developments. Major organizations profiled in this report include Actavis plc, Akorn, Inc., Bayer AG, F. Hoffmann-La Roche, Ltd., Merck & Co., Inc., Novartis AG, Perrigo Company plc, Pfizer, Inc., Santen Pharmaceutical Co., Ltd., and Valeant Pharmaceuticals International, Inc. Additionally, market share analysis that has been provided in context with the major pharmaceuticals operating in the market would help new participants to understand the key business perceptions and frameworks and to identify the specific product lines of the existing companies to establish a strong foothold in the bacterial conjunctivitis drugs market in the U.S.